SAY CHEESE! Tomorrow ispicture day. All students need to be inuniformand all students will be photographed for official school records. If you choose to purchase these pictures, please be sure to send in theorder form and payment, if you have not already done so. FORE!! Please consider joining us for ourannual golf tournament. This fun filled day supports our technology maintenance and initiatives for all our students in all curricular areas. SEVENTH GRADERSled us in a beautiful Mass this morning! Through scripture, song and prayer we reflected on God's goodness in our lives and embraced our challenge to BE THE GOOD. Father John also reminded us of the 4 parts of our Eucharistic celebration: gathering, listening, sharing the meal, and going forth to serve. Mark your calendar for the firstRISE AND SHINE Massof the school year on Sunday,September 18 at 9:30. Our student leaders along with students from faith formation will help us celebrate Catechetical Sunday, a day when we remember all those teachers of Religion. Junior Highclasses are now 50 minute periods during 'regular schedule' days.AfternoonHomeroomis now2:50-3:00.If you are scheduling an afternoon appointment for your child, please try to arrange pick-up no earlier than2:55to ensure that students do not miss class time or homework recap/gathering time. With the start of school underway, it's time for our annual reminder aboutschool privacy rules.Ourschool directoryis to be used for school-related correspondence only.The directorycannotbe used for any business or non-school solicitations. In addition, it is very important to remember that parents should be very judicious in their use ofsocial media(photos, postings) that include information or photos of school children outside your family.If you do not have explicit permission to include a photo of any child outside your family, you should not post that photo on social media.The entire parent community is responsible for following our school privacy rules, as they are for the benefit all of our families. 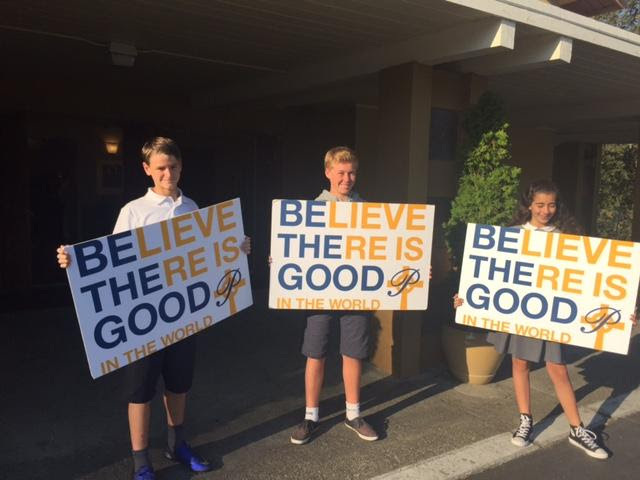 Please remember thatthere isno parkingin front of the Church after7:40 am.If parents or guardians want to drop off or pick up students from the front of the school, parking is available on the upper lot.Please meet your students in front of the school.Students are not permitted to wait in the plaza area, which has no supervision.Parents and students should not walk through the carpool line at anytime.Thank you for your assistance! School Picture Day isTomorrow, 9/8.All students wearschool uniforms.The order envelope is coming home with your child today.Please fill form out completely.All children will have their photo taken for our yearbook and class photo even if you choose not to order any photo packages.Payment must accompany orderif you are ordering photos for your family use. After registering for the Tournament, don't forget to sign up your child forPanther Housefor that afternoon. That's always a very busy day in Panther House and we want to make sure your child has a spot! If you register beforeSeptember 7thyour student will earn a FREE DRESS PASS! 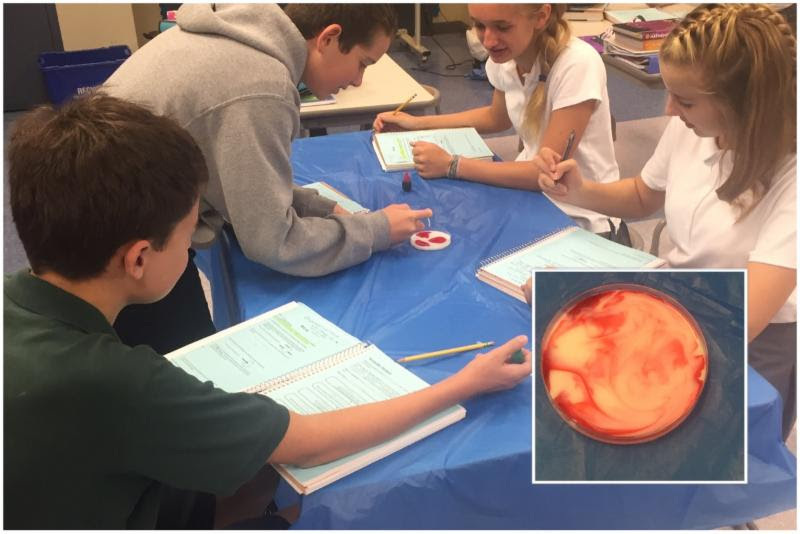 8th gradersand the scientific method: how does soap affect milk and food coloring? Students in5th, 6th, 7th, and 8thgrade who are interested in joining Leadershipmust attenda meeting atmorning recessonThursday 9/8orFriday 9/9in the 8th grade classroom. At the meeting, students will learn about how to join and the duties involved in the program. Applications are only available from Ms. Schwarck. Students in3rd and 4thgrade do not apply at this time. They can apply inDecemberto joinJunior Leadership. More info to come! be in 5th, 6th, 7th, or 8th grade. have strong academic standing and conduct. be able to follow instructions and procedures well. be able to take initiative and follow through with tasks. be willing to sacrifice recess or luncheveryThursdayforLeadershipmeetingsandvolunteer additional time and help towardLeadershipendeavors: spirit activities, sales, publicity, etc.Leadershipis a HUGE commitment! Please contact Ms. Schwarck athschwarck@csdo.orgif you have any questions. There arefive Sign-Me-Up partiesstill open for registration!Margarita Mamas,Mother-Son Dance,Trivia Night,Dad's MedleyandFather-Daughter Danceare all open for additional registrations.It's a great way to get involved with the school community and it supports our Parent Association fundraising efforts.Clickhereto get additional information and sign up for these events. 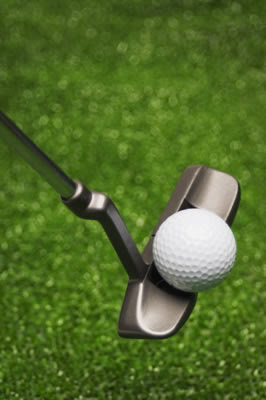 Registered for the Golf Fore Technology Tournament? Supported our Parish Oktoberfest Festival with raffle ticket purchase, silent auction donation, or volunteer sign-up? Checked out the exciting after-school Panther House classes? Updated your student's grade in Food For Thought orders? Filled out your September Panther House Calendar? Checked out the available Sign-Me-Up parties? Looking for an opportunity thatfulfills all 35 volunteer hours? Enjoy working with a group of creative 8th graders? Love page creation and photographs? We are looking for one or two parent coordinators to oversee the creation of theSt. Perpetua Yearbook! Youdon'thave to be the parent of an 8th grade student! You will have greathands-on supportfrom Jostens reps and also the 8th grade Room Parents who will facilitate photo collection with students and the other Room Parents for our fabulous 2016-17 yearbook. Contact Renee O'Neilltomrene@pacbell.netwith questions or interest! Our entire school will celebrateBlackout BINGO! Daythanks to the many students and staff members who achieved Blackout BINGO's for the Summer Reading Program.Three staff members and 45 students achieved BINGO! Blackouts! Wow! Blackout staff members are Mrs. Kozel, Miss Ice, and Mrs. Hinton. Thethird grade classwins tickets to theMVP Ice Cream Socialfor having the most participation in the summer reading program. Blackout BINGO! Day isFriday, September 16th. All students and staff may participate. Everyone gets to enjoy free dress by wearing black school-appropriate clothing. Students who earned tickets to the MVP Ice Cream Social need to bring their MVP Ice Cream Social ticket to the amphitheater during recess to select their ice cream. All students are invited to the library during recess, where we will be playing a game of blackout BINGO. Please thankMrs. Anne Hawkinsfor organizing and running another successful Summer Reading Program. Please contact her atannekhawkins@yahoo.comto volunteer at the Ice Cream social. You can celebrate your child's birthday and support our school library's fundraiser by joining theBirthday Club. It's easy to participate!Birthday Club students select a book to be purchased and donated to the library. A commemorativenameplate will be placed in the front of the book to honor the student's Birthday.These donations help us to populate the library with the new, popular books that the kids want to read. Simply fill out theformand submit it to the front office with a check for $20 per student. AllBirthday Club formsaredue in September. In October, all students will select birthday club donations, regardless of their birth date. Thank you for supporting our school library and helping kids to easily access the books they want to read! 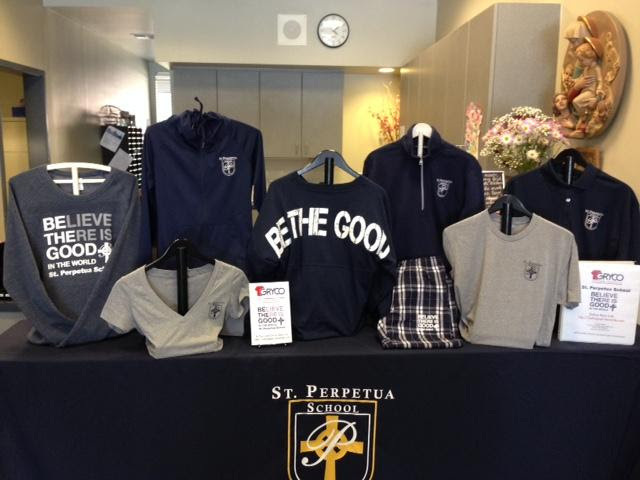 We debuted our new Spirt Wear for parents and students at our Welcome Back Coffee.The response was great, and we are now taking orders.We have student sizes for T-Shirts, Pajamas and Spirit Jerseys.There are also lots of items for Moms and Dads.Clickherefor the link to the Spirit Wear and show your school pride all around town! Please join usthisFriday, for thefirst Cafe` Perpetuaof the school year! Stop by and to see old friends and and meet new families while shopping for breakfast! Our homemade breakfast items include cinnamon rolls, coffee cakes, seasonal breads, muffins scones, bars, gluten free baked goods, breakfast sandwiches, frittatas, yogurt parfaits, and specials of the day. You can pick up a cup of coffee, latte, hot chocolate, and fresh juice. We will also be featuring delicious homemade organic jams (strawberry, red raspberry, blackberry, blueberry, apricot, and spiced pear), zucchini breads, pesto, and summer salsa. 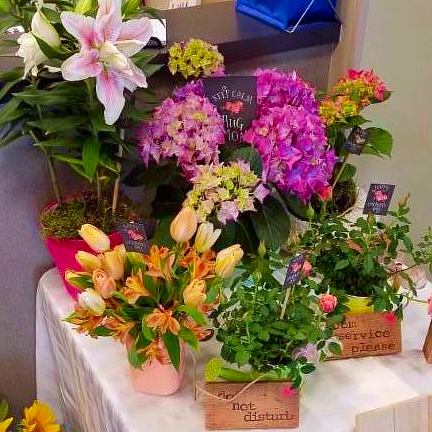 All of these make awesome hostess gifts including the fresh flower arrangements from the Garden of Learning. Organic produce will also be available for sale. We can't wait to see youon Fridaymorning! Please know that your patronage at Cafe` Perpetua is the sole support for the Garden of Learning! 1)LIVESCAN FINGERPRINTING: Clickherefor the form.Note: you have to get a specific form from our front office, go to a LiveScan location for fingerprinting and bring the stamped form back to the school office.Once we get the results back from the Oakland Diocese, you will be officially cleared.Fingerprinting clearance has no expiration, so once you are cleared by the Diocese you no longer have to track. 2) Certificate of completion for theSAFE ENVIRONMENT TRAININGonline (clickherefor Virtus online training).Note:if you completed your Shield The Vulnerable training in the period August 1, 2015 - May 30, 2016 (and we have your certificate on file in the office) you do not have to take Safe Environment/Virtus training until August, 2018. 3) A copy of yourTB TEST orTB QUESTIONNAIREfilled out by your Doctor as an alternative to a TB test based on your doctor's assessment.Print the Questionnairehere, or on the school website under Documents.Note:your TB clearance is good for four years. OnFriday,September 30thVNA and Livescan Fingerprinting will be on campus again. VNA will administer bothFlu shots($30 cash or check) andTB screening($10 cash or check) from7:30am-10:00am. Livescan will offerfingerprinting($34 cash or check) from7:30am-8:30am. This week it's all about the fun, educationalFall After School-Classeswhich beginSeptember 19!HURRY! HURRY!Classes are starting to fill fast.To make it even more convenient, we are trying something new! We have set up a Signup Geniusfor each class. Click thelinksbelowfor class information and sign-up.If you havealreadyregistered your child via the paper form and sent in a check, your child has been automatically added to the Sign-Up Genius. Note:Your child is not considered enrolled until we have receivedpayment(checks or cash only, made out to St. Perpetua School,with class name in memo line).If the class does not get the minimum number of participants required for the class, you will be notified and your payment will be returned. We are now settled into our neworder & pick-up cycle for this year:Online orders placed byFriday(midnight) will be available for pick-upin the office thefollowingFriday. Orders placed by 8/26 came in Friday 9/2 and are now available for pick-up in the office. All orders need to be placedonlinevia your ShopWithScrip account. All vendors, including our local Lafayette vendors, can be ordered online. Paper orderscan no longer be accepted due to Diocesean rules. A reminder that the current Scrip tracking period is1/1/16 -12/31/17. To sign up for scrip use the following codes.